This book teaches the classic data structures with an informal, yet rigorous, approach; it includes the appropriate object-oriented concepts and makes use of the appropriate Java constructs. 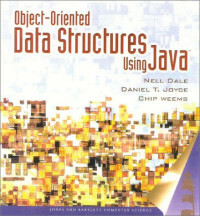 Welcome to the first edition of Object-Oriented Data Structures using Java. This book has been written to present the algorithmic, programming, and structuring techniques of a traditional data structures course in an objectoriented context. You’ll find that all of the familiar topics of lists, stacks, queues, trees, graphs, sorting, searching, Big-O complexity analysis, and recursion are still here, but covered from an object-oriented point of view using Java. Thus, our structures are defined with Java interfaces and encapsulated as Java classes. We use abstract classes and inheritance, as appropriate, to take advantage of the relationships among various versions of the data structures. We use design aids, such as Class-Responsibility-Collaborator (CRC) Cards and Universal Modeling Language (UML) diagrams, to help us model and visualize our classes and their interrelationships. We hope that you enjoy this modern and up-to-date approach to the traditional data structures course. What you need to know to survive, long term.